We've had a few changes going on in the house recently. The German that moved in had to leave after only a month because he was made redundant (unfortunately like so many people at the moment) and as the rental market has gone nuts I've been given permission to make a few changes to the place to generate some interest. 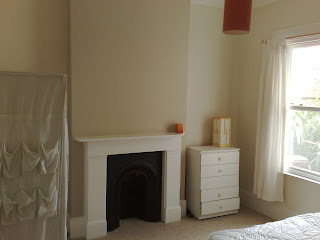 The downstairs bedroom was a bit of a mess with damp patches, blistered and peeling wallpaper and the chimney breast was just plain awful. 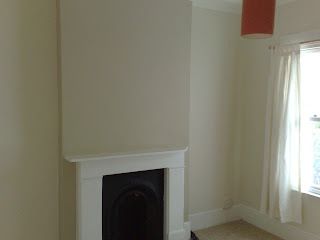 The wallpaper had been wrapped around the corners really badly which left a twisted and deformed edge on both sides and there were bumps and lumps everywhere. Unfortunately I forgot to take a photo of that before I started weaving some All Mod Cons Magic about the place. Anyway, I started trying to do the minimum amount of work possible because it is, after all, just a rental property and as I don't own it I'm not too fussed about doing an A grade job (and I don't exactly get a "commercial" rate of pay from my landlord to justify spending ages on anything). 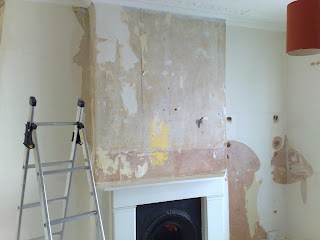 Out came the Stanley knife and I set about removing as many of the blisters as possible, including the edges of the chimney breast and the inside corners of the alcoves. 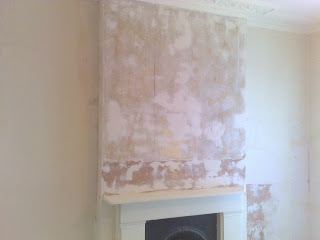 The rawl plugs got pulled out, but as the plaster was blown, I was left with rather nice deep holes in the walls. 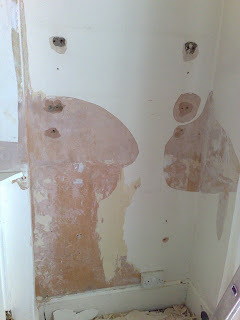 All the lose wallpaper was cut off (there wasn't a decent enough wall to stick it back to) and all the damp paper was removed. 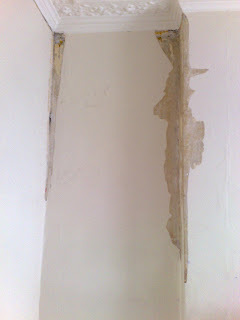 The twisted paper in the corners got cut out, only for the plaster to fall out too leaving thin but bottomless cracks. 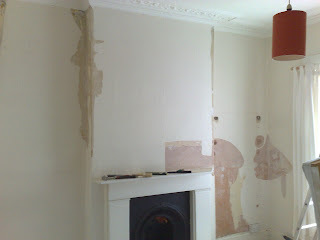 I then got a little carried away with the cutting and scraping...after a while I ended up totally removing all the paper on the chimney breast and down its sides leaving me with a significantly increased workload. But sometimes I just can't resist picking at just one more bit of lose wallpaper. 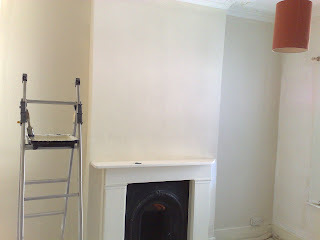 It then got painted once in the wall colour top coat at the same time as the rest of the room was done. 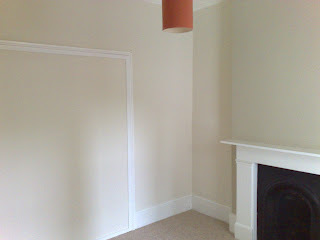 And finally I painted it twice in a slightly different colour, from the same palette of Farrow & Ball colours. All the woodwork was filled and sanded (before the final top coat on the walls) then painted in a white oil based eggshell (smells a bit, but when it dries properly is much more durable than a water based paint). New carpet was also put in. Previously it was black. Not through dirt, but actually black. I've no idea who puts black carpet anywhere in a house but it's bloody awful and up until recently was in 4 rooms (3 of them bedrooms). Only my room and the living room are left. The carpet was purchased from Carpet Right, for a very reasonable price, and fitted (by fitters who were shite...another long story...although the carpet does look good down). Then the furniture was put back in, although we really do need to change those drawers. That'll be done this week sometime I should imagine. I think it's turned out alright. I considered moving into it from my current room because it's a lot bigger than mine. But it's also more expensive, and times being what they are, I can't afford a rent increase. I'll just have to wait until I get around to doing my room again. Although there's not much you can do to what effectively rates as a shoebox. 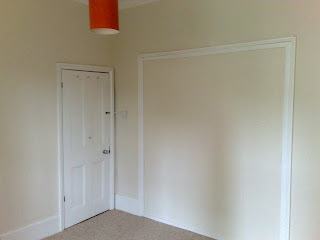 Hmm...and that orange lampshades needs to go too. And I need to take a little off the bottom of the door now that there's carpet with underlay. Never ends this home improvement lark! So, who wants to move in? I’d love to move into that room. It’s lovely. Unfortunately, the fact there’s an ocean between me and the room makes such a move prohibitive. I’m inspired. But not in a D.I.Y. way - more like a get someone else to do it for you kind of way.